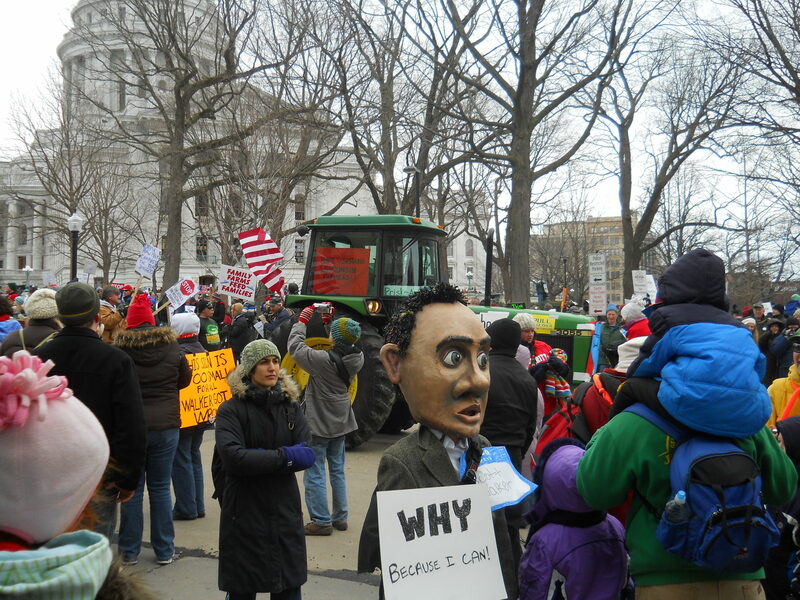 I took the boys to the protest in Madison. This is the 26th day. There was a “Farmer Labor Tractorcade” in the morning. At first the boys didn’t understand what was happening, but they liked the excitement. Children pay attention when adults are excited about something. I did my best to explain the complicated issues to the boys without simplifying too much. 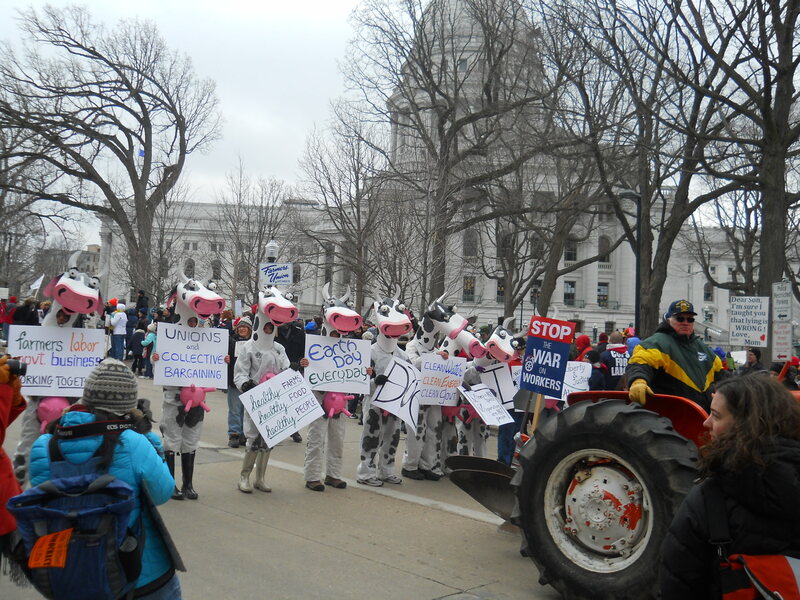 The way Governor Walker is ramming his agenda down our throats is probably what riles the people of Wisconsin the most. He has always claimed it’s about the budget, but when he couldn’t get the 14 Democrat senators who fled the state to return to make a quorum, the bill to eliminate collective bargaining was stripped from the budget bill, and passed in two hours. The last few years has seen the rise of the Tea Party, which is considered Right Wing. This movement would be considered Left Wing. They are approaching the problems from different angles, but it boils down to Americans concerned about their future and the future of their country. This entry was posted on Sunday, March 13th, 2011 at 12:42 am and is filed under Curious government, Curious living. You can follow any responses to this entry through the RSS 2.0 feed. You can leave a response, or trackback from your own site. Thanks for taking your tractor and your boys to the protest and showing your support. I agree that protest is an important right that forms part of a functioning democracy, but slogans and chants …? I judge each protest on its merits. Some just represent an excuse to run riot and smash things up, others are just ‘gee whiz’ opportunities to feel part of something big – a togetherness buzz. Some are just ‘rent a mob’. Some of course are important and wholly justified. I have no idea which of these the one you observed qualifies as, but a mob doesn’t necessarily look like democracy to me. For the record, I decided to take the boys, and not the tractor. This is definitely a peaceful protest. It’s amazing how few problems and arrests, especially considering the size of the crowds. There is a togetherness buzz, but there is legitimate concern which is bringing people together. 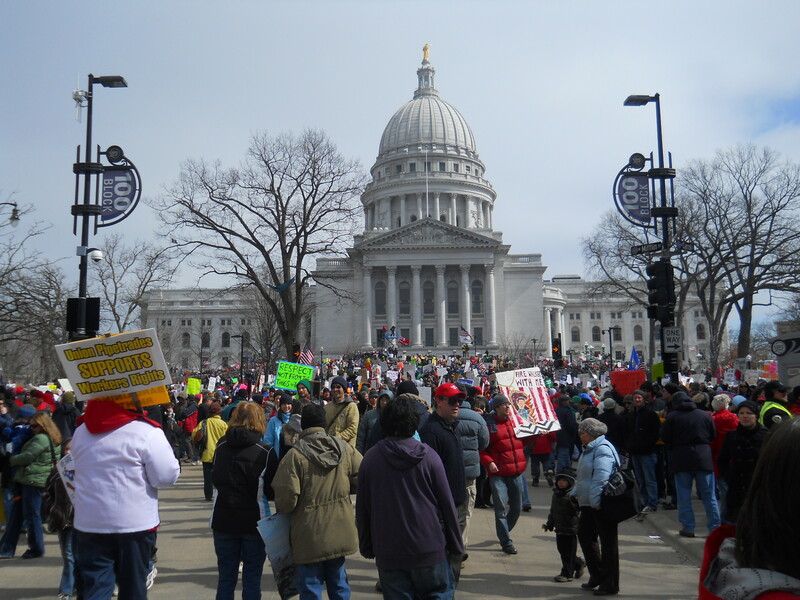 may i please have permission to use your photo of the capitol dome and protesters on a website i am developing for a nonprofit presenting an economic democracy conference in Madison next October? Sure, I’m glad to give permission. Thanks for asking. Will you provide the link once your site is up? Thank you! Sure, the site is http://economicdemocracyconference.org. Hope you like it! I will credit you, “curiousfarmer” in the ALT tag, since i hope it will work as part of the slider.